By pavlik1307, May 4, 2018 in Plugins - Publishing ONLY! 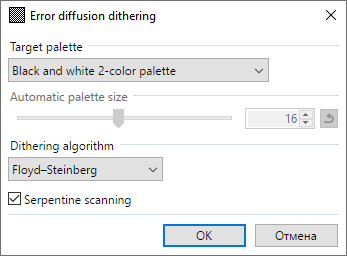 This plugin allows you to reduce the number of colors in an image with the help of eleven error diffusion dithering algorithms. 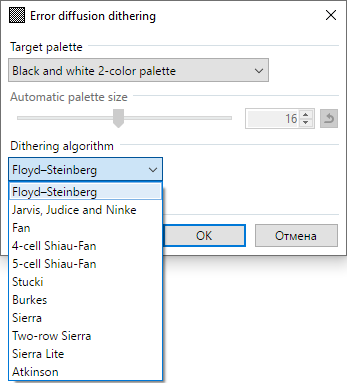 You are able to choose one of the four software palettes or to use automatically generated palette with specified size. You can also enable "Serpentine scanning" to alternate scanning direction between lines. Unfortunately, these algorithms do not work quickly due to single-threadedness. The advantage of this plugin is that it correctly works with any selection. @pavlik1307! Thank you for your effort. 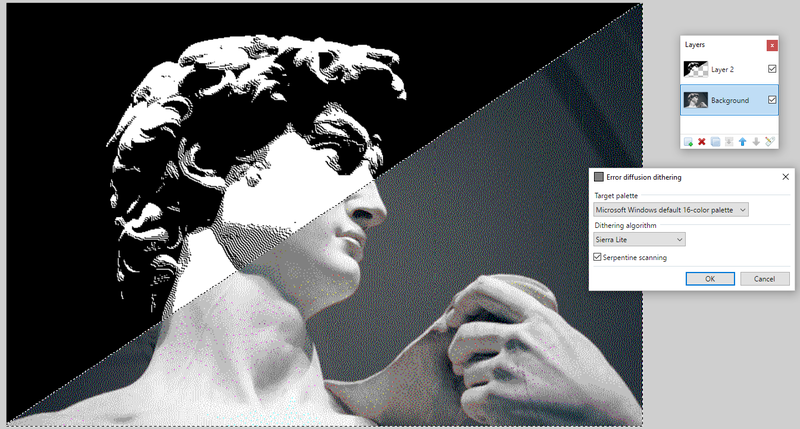 Why would someone want to apply dithering to their images these days? ^ This is not a rhetorical question. I recommend placing this effect into the Stylize menu. If the dithering algorithm locks bits and iterates through pixels with two for loops, replace the inner for loop with Parallel.For (look it up, it's easy to use) and you'll get some parallelization without much effort. Thanks for this effect @pavlik1307 . 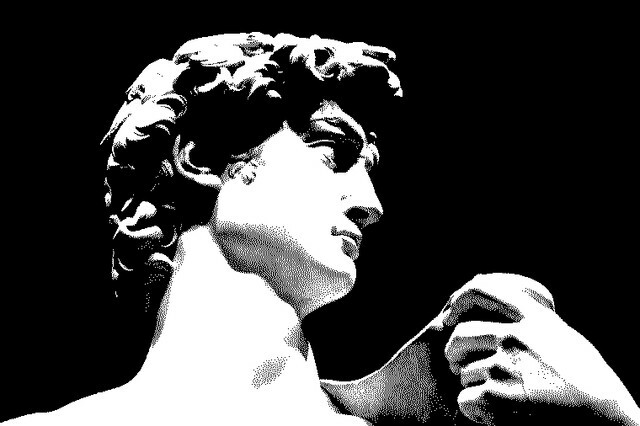 I found in GitHub some interesting dithering results. There is one that I like the "Sierra Lite" . Do you think that it could be added to your effect? @pavlik1307 Sorry I did not see it. I have tried but I can not get the same result as un Github. Thanks for the "Black and white 2-color palette" addition. The result is very close. I think that you should integrate in the effect contrast and brightnes sliders that way you should have better control over the results. If you find out what other actions were applied in the Github example and add them to the effect would be nice too. The "wavy dithering" is very interesting. It looks like the ones used on the presidents' portraits on the dollar bills. Artistic effect or compatibility with very old games/softwares. Some older games have limited palette, and to reduce banding, dithering is used. If you are modding say Ultimate Ride Disney Coaster, you'd note that dithering is the only way to reduce banding in menu images. Some games are reduced to 256 colors, and dithering helps the issue of banding. For artistic effect, amiga images achieves have some very nice images of how low color and dithering can give a oil feel that is somewhat rough. 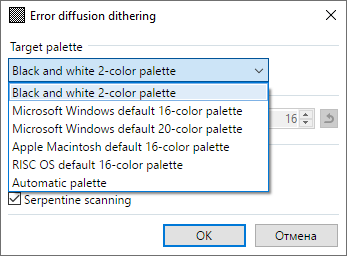 But, I do agree that for modern softwares purpose, for all intents and purposes, dithering isn't very useful, and there's no point to it unless you have a taste for it or you specialize in pixel art. Indexing still have use in separating colors for generating effects though. Threshold filter has some very useful niche usage for example.